Taken from the book: Ryde Isle of Wight Its Sports and Attractions: The Club has flourished for no less than 24 seasons. 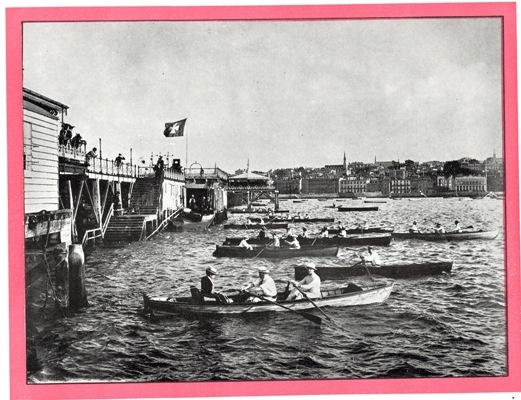 Early in the Eighties it was undoubtedly the first Rowing Club on the South Coast. In 1881 it could make the proud boast of never having been beaten at any of the Coast Regattas. It now has a largely increased membership, and affords much pleasure to residents and visitors by the rowing facilities it offers on advantageous terms. The boat-house on Ryde Pier is a commodious structure with a private landing-stage, and is well fitted with dressing-rooms, baths and other accommodation. It can be used for launching boats at all states of the tide. The Club has an unsurpassed fleet of no less than 30 boats, including dinghies for swimming and fishing purposes. There are a number of lady members, who take part in the fortnightly races which are held during the season. Bembridge, Sea View, Osborne Bay, Cowes and the Medina, and the pretty village of Fishbourne are all within easy distance and thither members often repair by means of pleasurable rows.